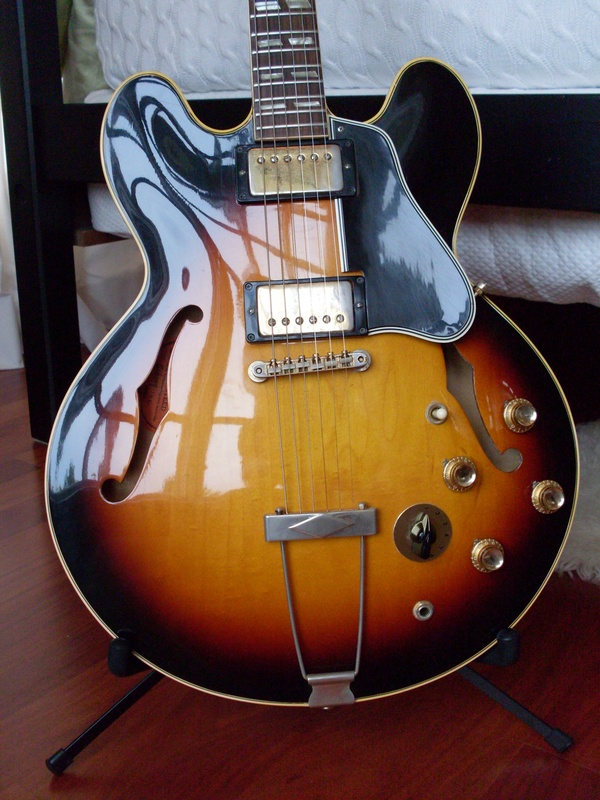 The ES 345 is perhaps my favorite guitar of all time. 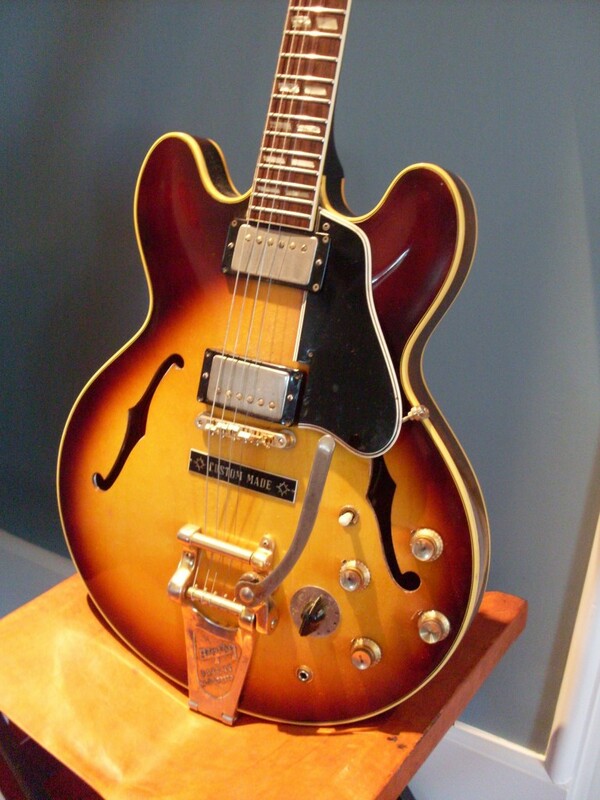 A lot of folks don’t like the stereo wiring and the Varitone switch but those can be removed if you choose to do so. The fancier binding and the split parallelogram markers make for a very classy instrument. 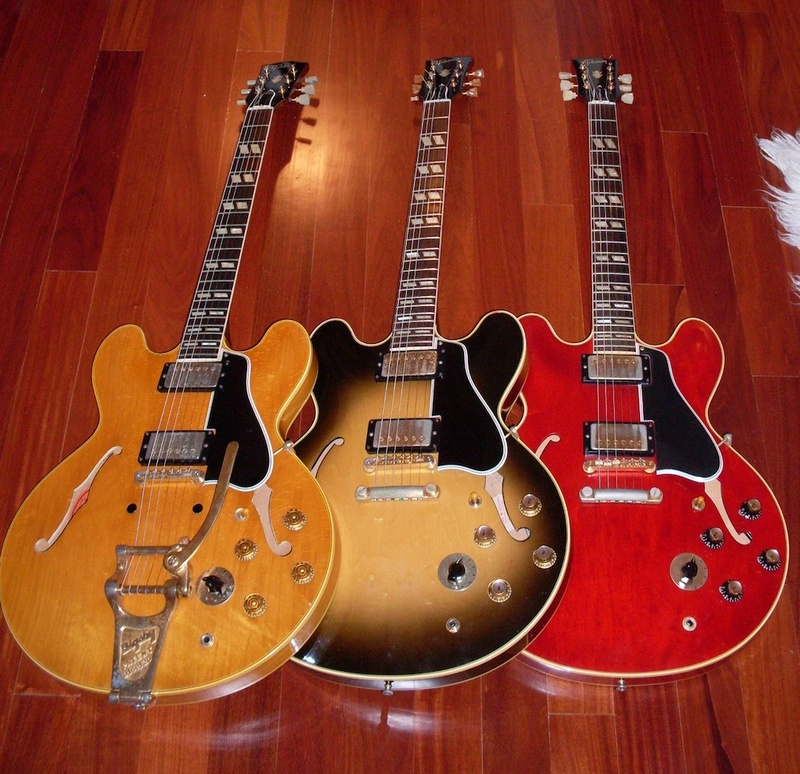 They usually cost less than the corresponding year’s 335 and yet, they are so much cooler. To me , anyway. There’s good news and bad news. Good news-original finish ES-345TDN. They only made 50 of them. Bad? Busted neck, two holes in the top and mostly changed parts. Stay tuned, this one is coming back. Joe Bonamassa says “black is the new blonde” and I think he might be on to something. 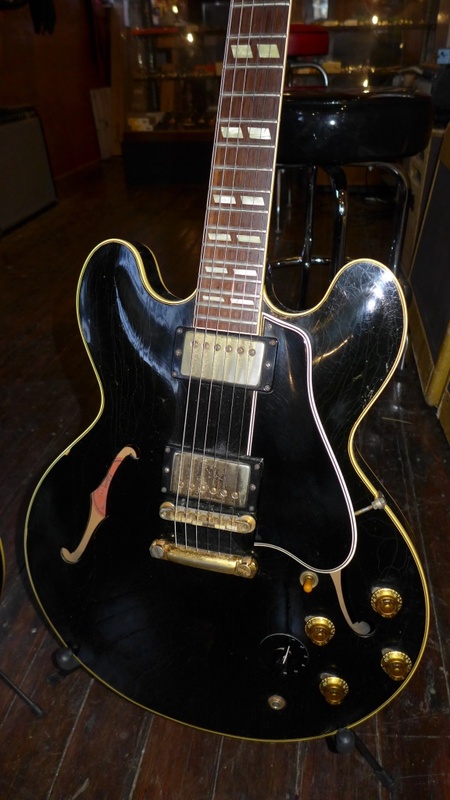 Watch black guitars in 2016. They will be smoking’ hot. 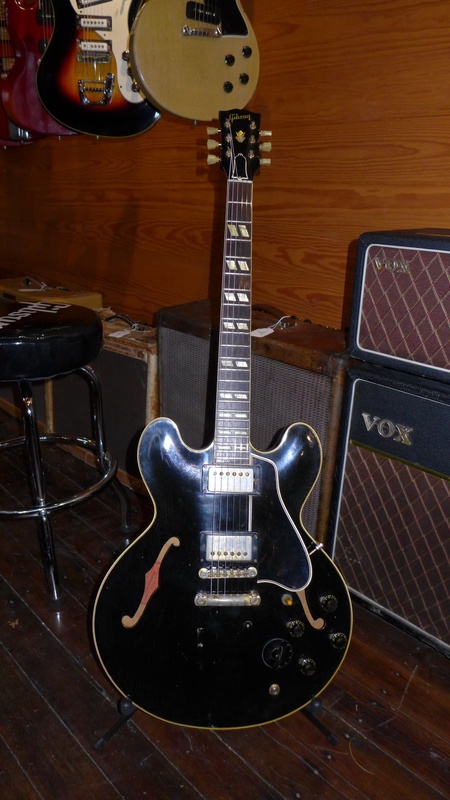 Having two black 345s at once must be some kind of record. It doesn’t get much better than this. 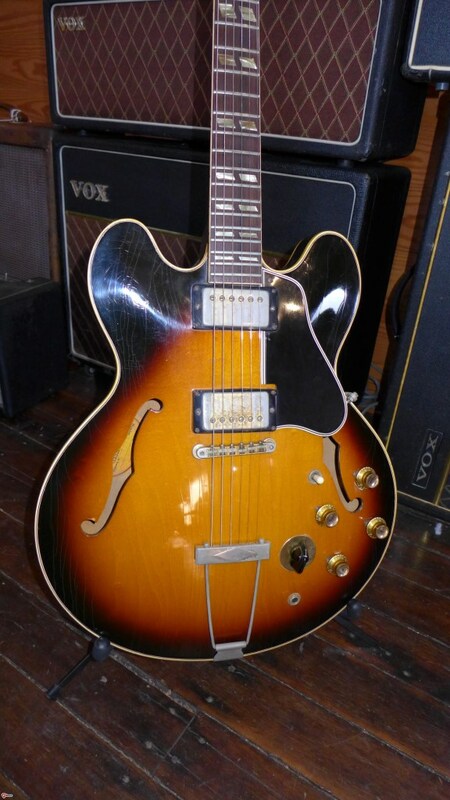 Rare 59 stop tail ES-345 TDN. Not good enough for you? How about sealed double white PAFs? Nicest 345 TDN I’ve ever seen. 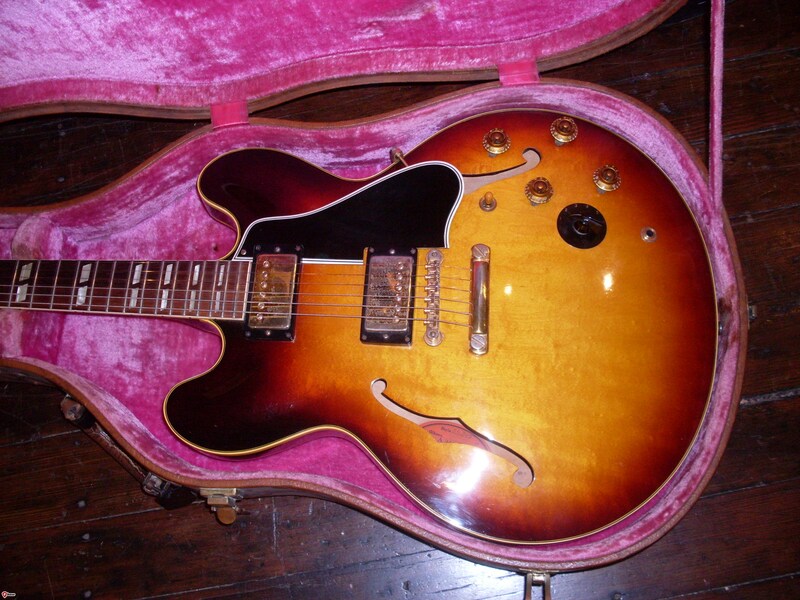 Here’s another 59 ES 345 TDN. 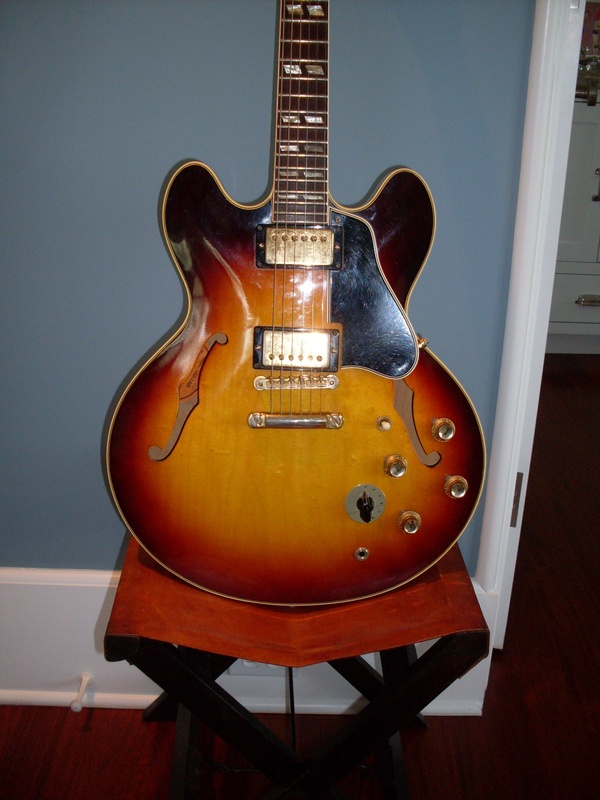 This one was refinished but was still stunning. 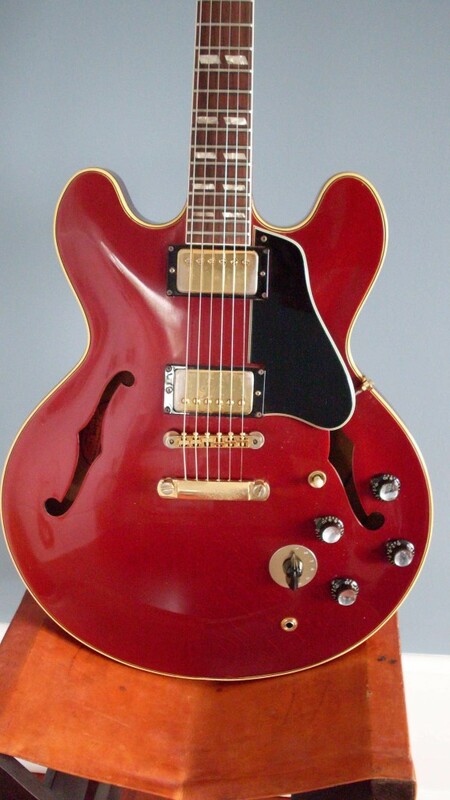 This mid 60’s, probably a 66, ES-345 had been stop tailed and Schallered and was that funny Sparkling Burgundy color but it played great and was cheap. Mint. Really. A 60 with a sideways that even smells new. Stunning. Even the case is mint. 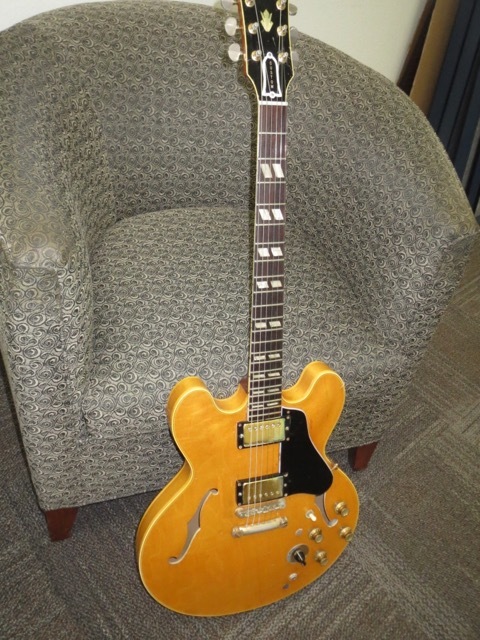 I got this ’60 from an old gospel player in rural North Carolina. Even when you beat the crap out of them for 40 years or more, they keep on keepin’ on. 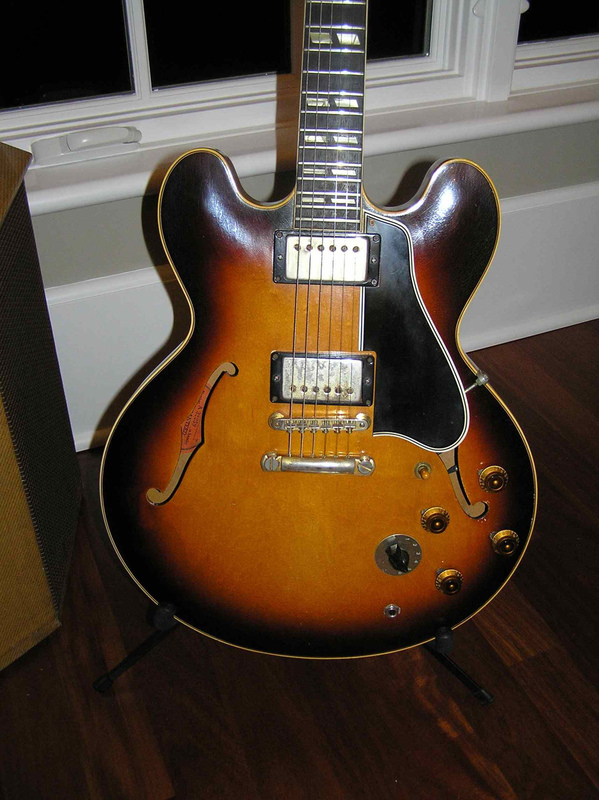 This is a well played ’63 that lives in California now. 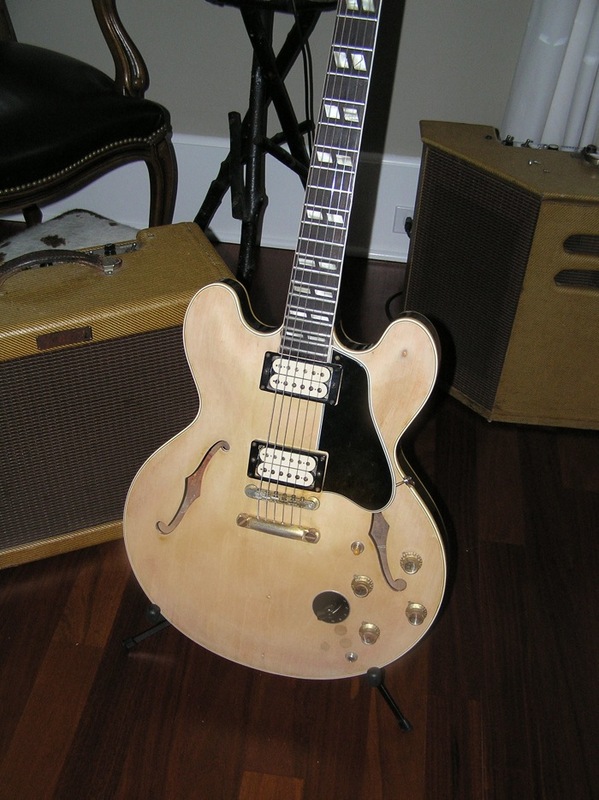 Yes, that’s the wrong Varitone ring. 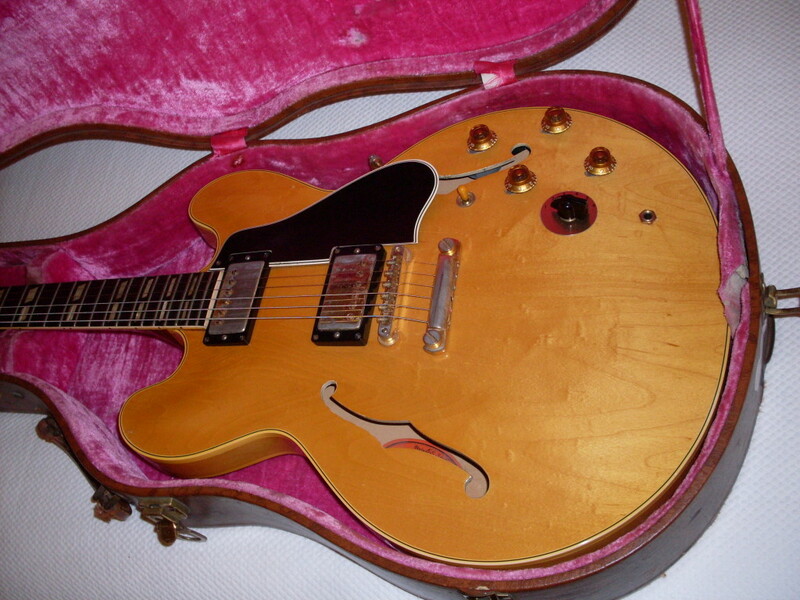 I changed it to a gold one before I sold it. Just another photo of the three colors these came in? Nope. They came in four colors and the one in the middle is called Argentine Grey. It’s different from the normal sunburst in that there is no red. They are all from 1960. 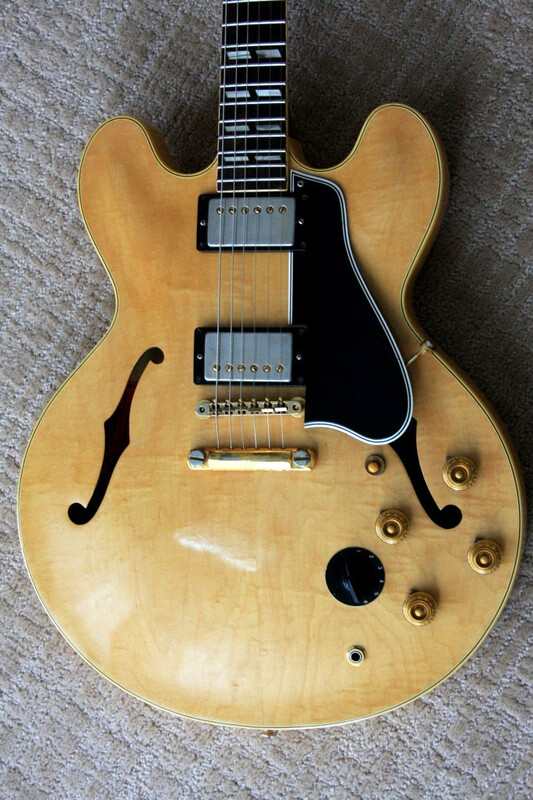 My first blonde ES-345. What can I say. She’s a beauty. 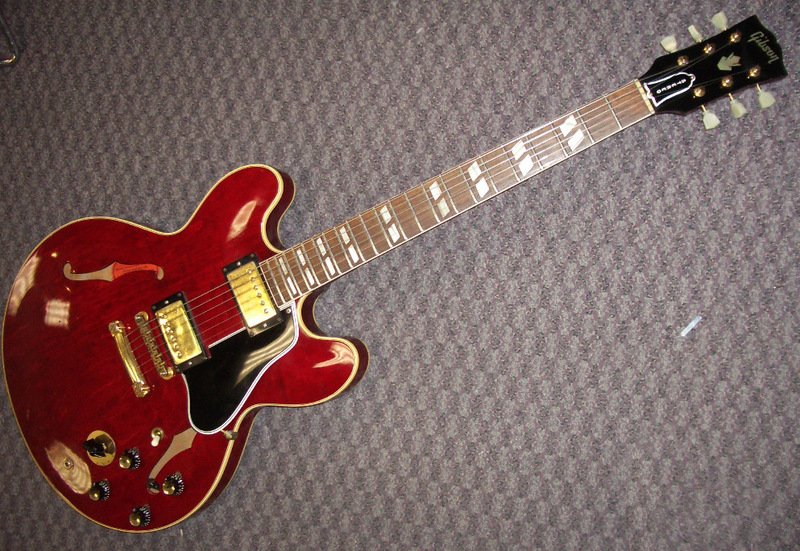 This ES-345 is an original stop tail from 1964. The near mint pieces never last long around here.. 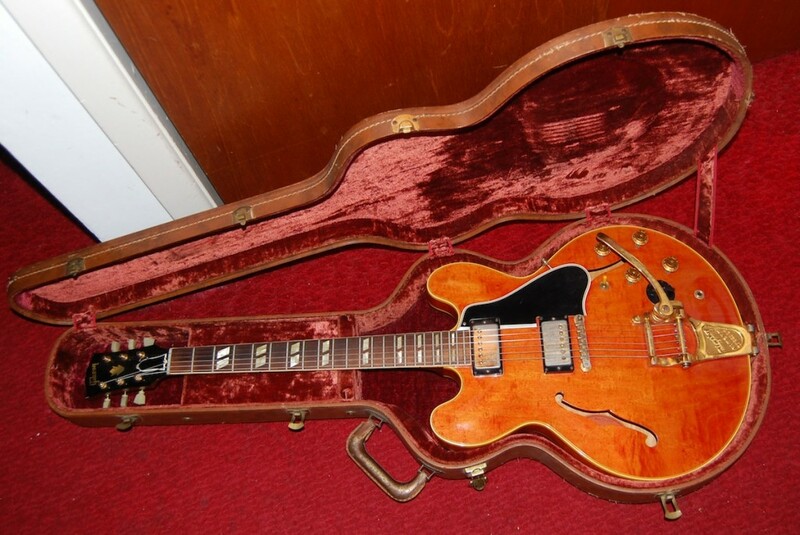 This stunning 1960 stoptail 345 was bought at auction by me. For me. It’s mine (for now). Here’s one from a reader. 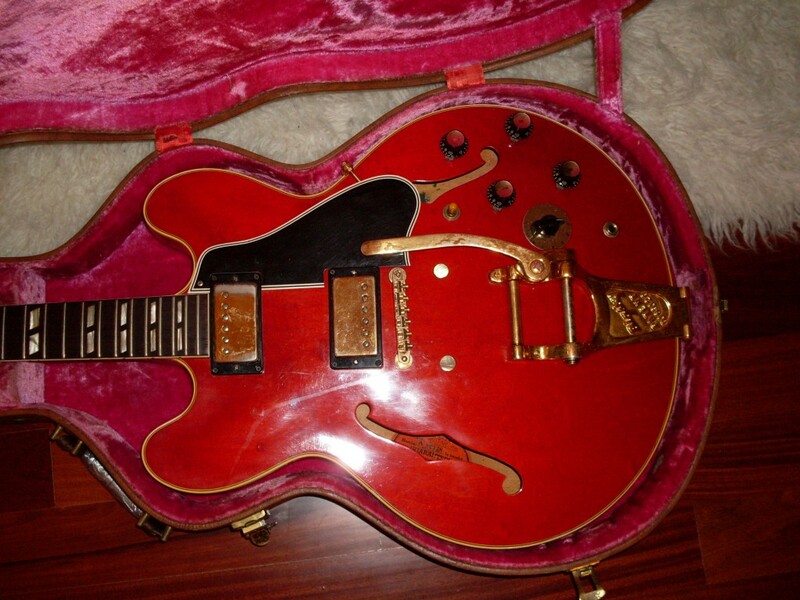 It’s a very rare 59 RED ES 345. I only know of 4 in the world. One was mine for a while. 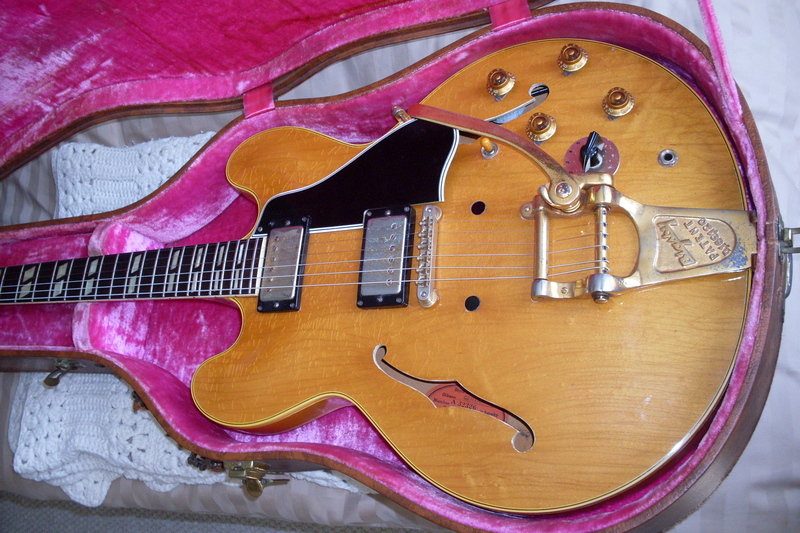 This one has a factory Bigsby. 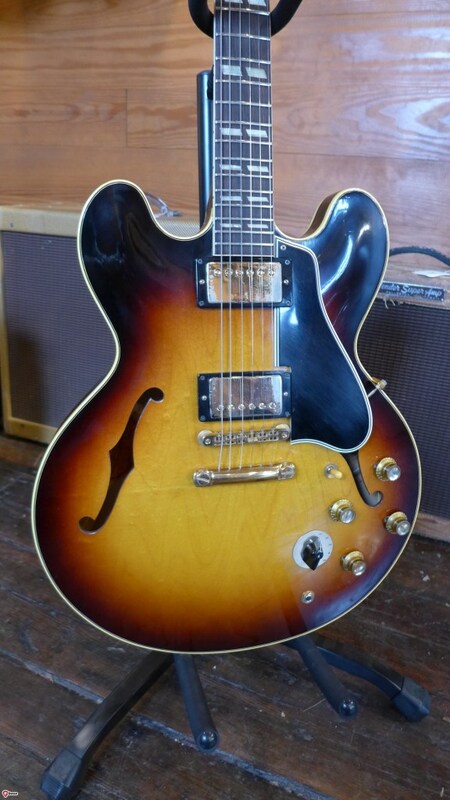 The finest ES-345 I’ve ever seen. It was mine for a minute or two. 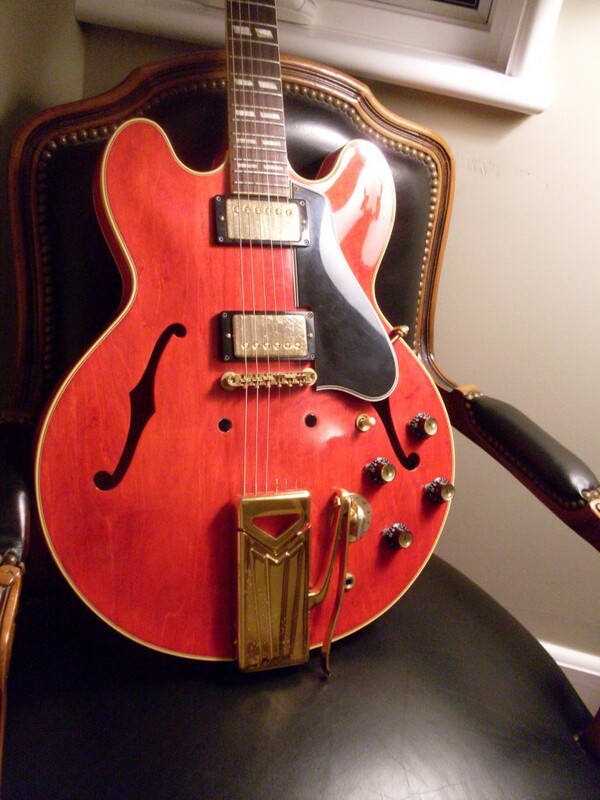 It’s an all original, near mint 1959 in RED. One of only 6 known to exist. Top stripped and a whole bunch of plugged holes but double whites and a great player. 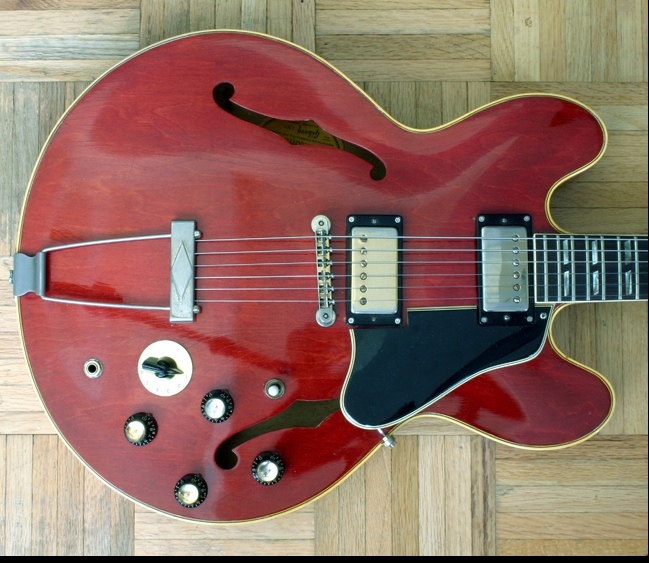 Late 59. 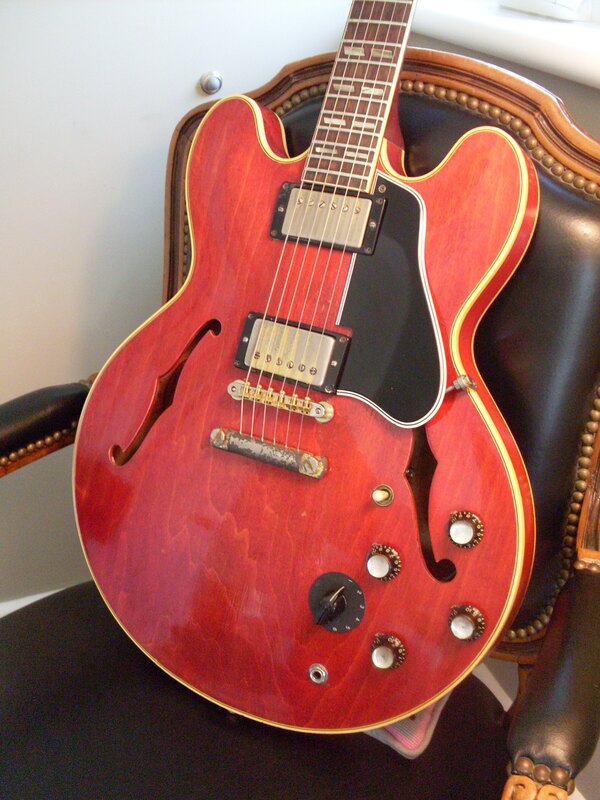 Really Nice ’60 345. I didn’t buy it because I thought it had been renecked. 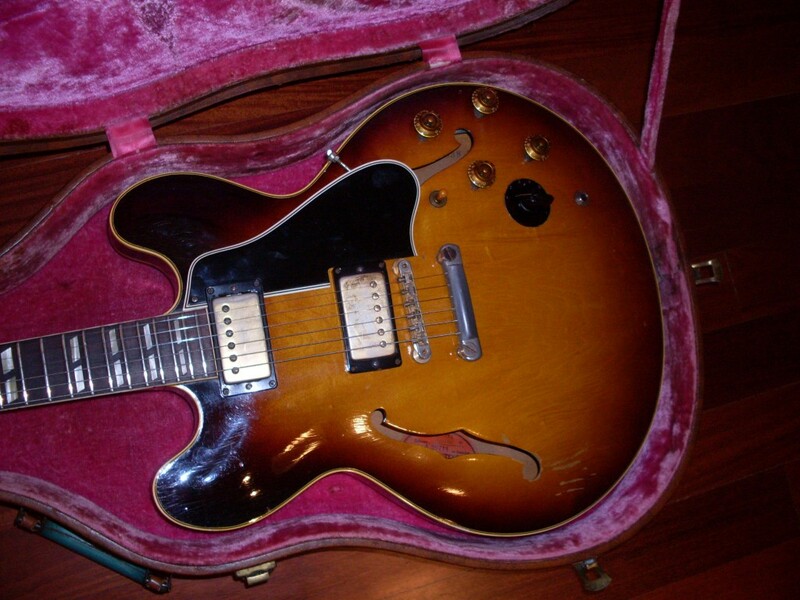 Charlie, what would a headstock break do to the value of one of those nice ’59 ES-345s? 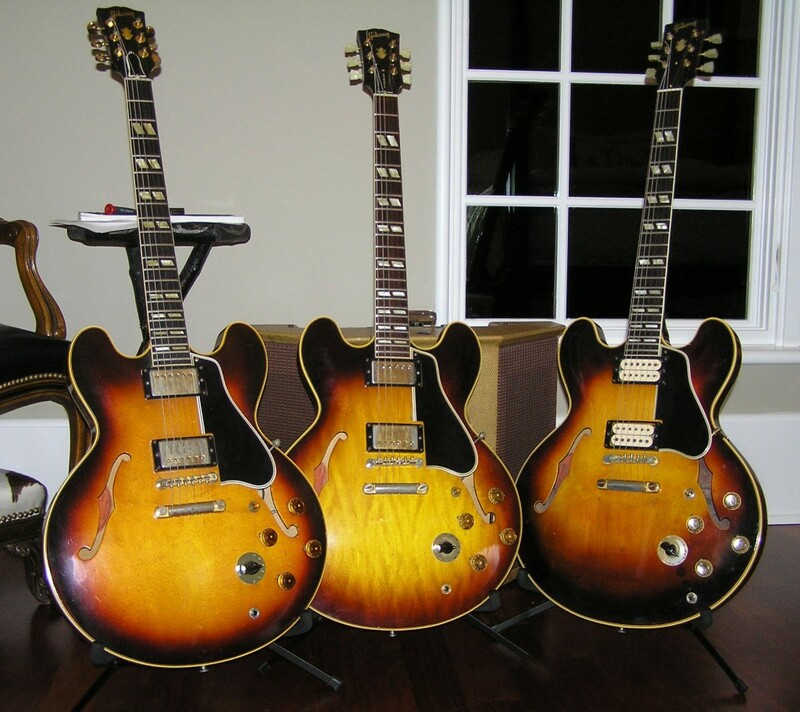 Not the first rack ones but maybe like the one you have with the gold ring, can a buyer expect a solid 50% off? 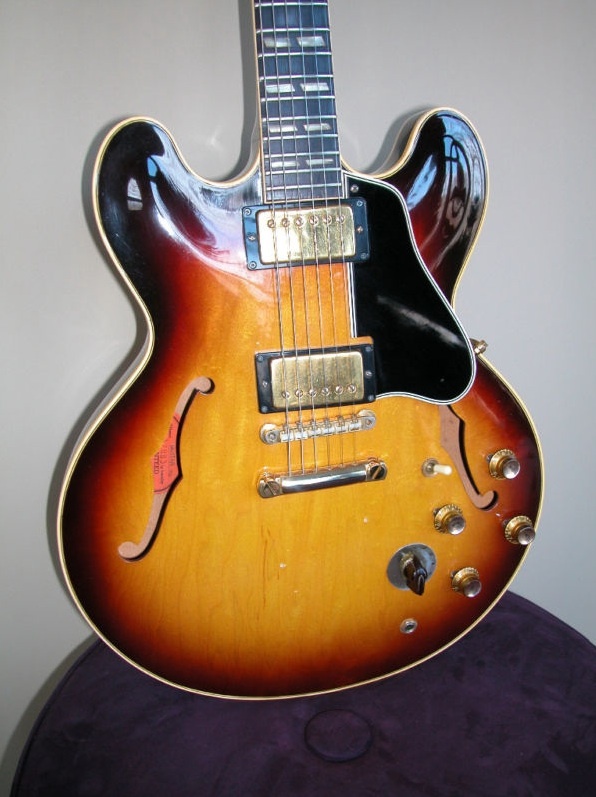 So does a sunburst like that, normally ~$16,000 become an $8,000 guitar with a professional headstock repair? Send me an email with photos. I buy lots of them. something about it that stood out, soundwise. I’d still have it today for sure. guerre! Thanks for listening. 345 forever! This came up for sale near me recently. I was interested in it but certain features of this guitar just don’t look right to me… Any ideas as to what this guitar truly is would be much appreciated. 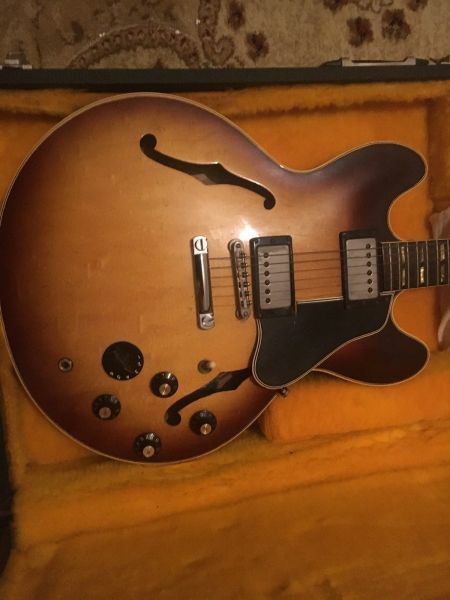 It would be nice if it was a “real” es345, but I have my doubts! Looks to me like a 66 or 67 with an added stop tail (should be trap). Changed Vari-Tone ring-should be gold. 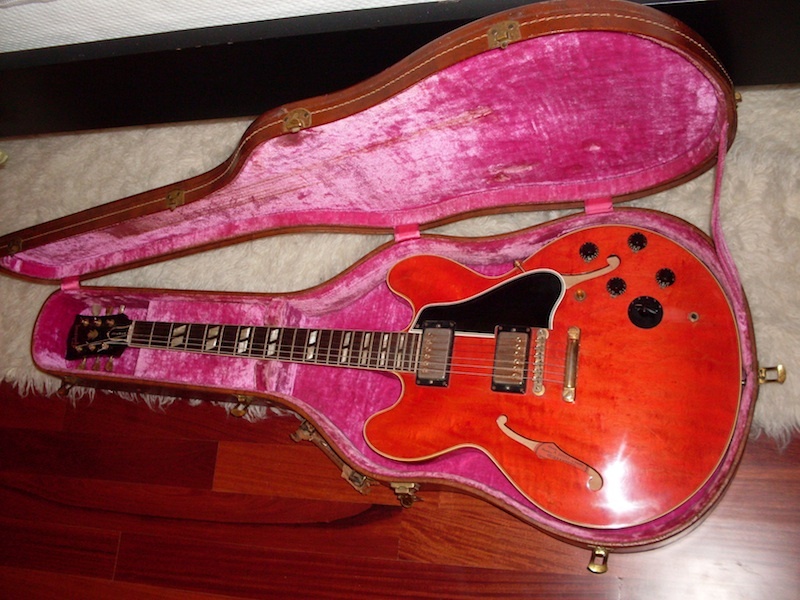 Looks like a legit Gibson in any case.